In 2017, the International Forum of Sovereign Wealth Funds (IFSWF) will be Exploring New Frontiers in Astana, Kazakhstan. At our first annual meeting in Central Asia, hosted by Samruk-Kazyna, we will be looking at new opportunities in an uncertain, low-growth investment environment. Registration for the public sessions starts from 15:00 on 6 September, with the event starting at 16:30. We will start proceedings with an official welcome from our Chair, Adrian Orr, followed a panel on developing a digital economy. The gala dinner, open for all, will be held that evening. Featuring senior executives from several IFSWF members, other experts and seasoned practitioners, the panel discussions on 7 September will address the different models and roles of sovereign wealth funds with mandates to develop their home economies, the challenges of the privatisations process for sovereign wealth funds and the investment opportunities privatisations provide. We will also pool our members' expertise on the investment opportunities provided by China's “One Belt, One Road” initiative. In the afternoon, our networking session will be a tour of the Astana Expo. Please see the link at the bottom of the page for the delegate list. Samruk-Kazyna will be signing memoranda of understanding with Italy's sovereign wealth fund CDP Equity, GE Digital and the World Bank. By disrupting familiar systems such as communications and transportation, new technologies are radically changing the way that economies and businesses work. But how can sovereign wealth funds best facilitate the growth of these technologies at home and abroad? What and where is the next investment opportunity? The number of state-owned strategic funds, with mandates to attract investment, manage state-owned assets and foster economic development, has grown rapidly since the financial crisis. This new generation of SWFs has reinvented and expanded their remit, adapting it to their specific local challenges. This panel will discuss these funds’ macroeconomic role as well as the strategies and metrics they adopt to help them deliver on their mandate. A growing number of sovereign wealth funds have the responsibility of transforming state-owned enterprises from struggling monopolies to vibrant commercial entities. This panel will discuss the challenges of this process and the technicalities of the privatisation process, whether through IPO or bringing in a strategic investor. China’s One Belt, One Road project seeks to build infrastructure to enhance economic, political & financial ties between China, Asia, Africa and Western Europe across land & sea. But how will it be accomplished? What is its significance and the implications for investors? 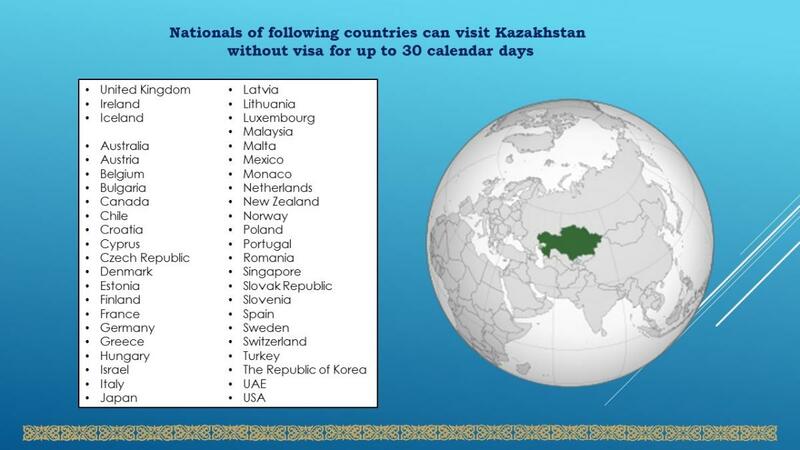 Kazakhstan has visa-free travel to citizens from 45 major countries shown in the graphic below. Citizens of other countries will need to apply for a visa. If you require assistance with accommodation or travel, please contact Carissa Henry who will be able to arrange for an invitation letter. Upon arriving at Astana or Almaty airport please proceed to a border control. If you require a visa you will be directed to a special Consul at the airport. The Consul will guide you through the process. Completed visa application form (download below). Note: Visa applications forms also will be available by request from Consul.